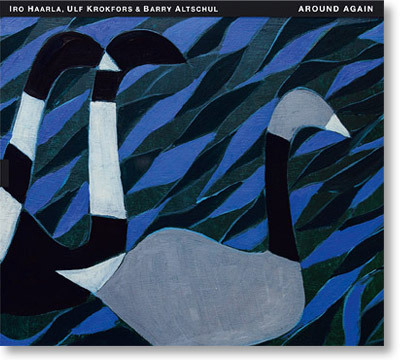 Around Again - The Music of Carla Bley continues Iro Haarla´s and Ulf Krokfors´ many collaborations over the last two decades. Both Haarla and Krokfors listened to Carla Bley´s music intently in their formative years and, in particular, early interpretations of her compositions by the Paul Bley Trio. This new album gives them the opportunity to present their own interpretations of compositions they have admired for decades. On drums, Around Again - The Music of Carla Bley features the legendary Barry Altschul, who played and recorded many of the featured compositions with Paul Bley and a revolving cast of bass players in the 1960s. "I greatly admire Carla Bley as an artist - her wealth of ideas as a composer and arranger, the talent to write entirely her own kind of music for large orchestras," says Iro Haarla. "I also admire how, through her own strength and independence, she has had such a remarkable career." "For me, playing in a trio format is the most rewarding and also the most challenging way of playing improvised music," says Ulf Krokfors. "The idea for this recording came to me when listening, after a long pause, to some of the early recordings by the Paul Bley Trio, with many of the compositions by Carla Bley or Annette Peacock." "Iro has a great understanding of Carla´s music and it was a wonderful experience for me to revisit this music with her and Ulf," adds Barry Altschul. Iro Haarla (b.1956) first became known through her work with Edward Vesala from the late 1970s until his death in 1999, including in the Sound and Fury ensemble. During the past two decades, Haarla has increasingly performed her own compositions both as a soloist and with her own groups, of which the most important are her Finnish-Norwegian quintet (Northbound, Vespers and Ante Lucem) and her Finnish sextet (Kolibri, TUM CD 035). Haarla´s compositions have also been performed by her duo with Krokfors (Heart of a Bird, TUM CD 004), the Haarla-Krokfors Loco Motife (Penguin Beguine, TUM CD 011), the Juhani Aaltonen Quartet (Conclusions, TUM CD 021) and the Iro Haarla & Juhani Aaltonen Duo (Kirkastus, TUM CD 045) as well as the UMO Jazz Orchestra and other big bands, among others. Ulf Krokfors (b.1966) first began playing the bass with composer and trumpeter Henrik Otto Donner´s quintet in the mid-1980s. Krokfors quickly made his mark as a member of Edward Vesala´s Sound and Fury (1988-1990) and guitarist Raoul Björkenheim´s Krakatau (1988-1999) and became one of the most in-demand bass players in Finland. He has collaborated with Juhani Aaltonen and Iro Haarla in various groups as well as saxophonists Sakari Kukko, Kari Heinilä and Esa Pietilä, organist Jukka Gustavson and pianists Samuli Mikkonen, Jarmo Savolainen, Seppo Kantonen and Kari Ikonen, among others. Krokfors has also released a solo bass recording (The Incense of All Our Prayers). Barry Altschul (b.1943), was born and raised in New York City and is a veteran of highly influential groups with Paul Bley, Anthony Braxton, Chick Corea and Sam Rivers, among others, in the 1960s and the 1970s. Altschul led several groups of his own particularly in the 1970s and the 1980s, recording some of the finest "freebop" albums of the period. After living in Europe for a decade and then focusing mostly on teaching following his return to New York City, Altschul returned to active playing in the new millennium establishing the FAB Trio (History Of Jazz In Reverse, TUM CD 028) with violinist Billy Bang and bassist Joe Fonda and also performing on the New York scene with many of his contemporaries, such as Roswell Rudd and John Tchicai. Since 2013, Altschul has led The 3dom Factor with saxophonist Jon Irabagon and Joe Fonda (The 3dom Factor, TUM CD 032, and Tales of the Unforeseen, TUM CD 044).